The ZyXEL GS2200-8 incorporates a high-performance switching architecture that provides 20/56/100 Gbps non-blocking switch fabric, 14.9/41.7/74.4 million packets per-second forwarding rate and wire-speed performance to connect high performance desktop devices with resources at the heart of the network. For branch offices and SME users, the GS2200-8 enables the delivery of converged applications and adapts to changing business needs with flexible configurations. The GS2200-8 is easy to use and manage for applications needed to support business operations as well as to increase productivity. The CPU protection feature can greatly reduce the likelihood of malfunctions. ZyXEL iStacking clustering management technology can manage devices across different floors and routing domains to locate other iStacking-capable switches in the same management cluster. This allows administrators to manage up to 24 switches with one single IP address. ZyXEL iStacking greatly reduces operating costs and offers more flexible maintenance of ZyXEL Switches. IT staff can opt for the Web or command line interface to suit their needs, and even encrypt their instructions with SSHv1/v2 and SSL. With these sophisticated functionalities, the IT staff is empowered to build a highly secure and efficient corporate network with minimum effort. ZyXEL considers IPv6 management features as future trend, and therefore added complete IPv6 management capability to the GS2200-8. 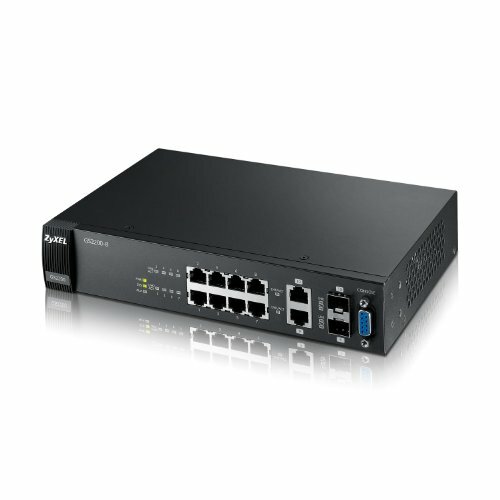 The great features are not only beneficial for high-density Gigabit Ethernet deployments, but also perfectly suitable for both network cores and edges.Besides, the GS2200-8 provides rich features including VLANs, CoS/QoS, Port Trunking, Rapid Spanning Tree, Security (Port Security and 802.1X authentication) and network management to meet evolving SME requirements. Meanwhile, the GS2200-8 delivers one of the most cost-effective Gigabit Ethernet solutions to empower Gigabit converged networking for branch offices and SMEusers.